The PCU is the heart of the Solar PV system. The function of the PCU is to convert the direct current (DC) generated by the PV arrays to Alternating Current (AC). The PCUs manufactured by the Novus Green come with Intelligent Solar Sensing (ISS) technology and are offered in different capacities ranging from 1 KVA to 25 KVA. Rated for continuous operation at full load. Dusk Dawn operation selection (Optional). Intelligent Solar Sensing ISS provided (Optional). Grid charging ON/OFF facility provided. Automatic re-start after over load triggered shutdown. The inverter section of the PCU has high conversion efficiency from 25% load to the full rated load. The conversion efficiency at 25% load is not less than 80% of that at full rated load. The effici ency of the inverter is more than 85% at full load. The output voltage of the inverter is sinusoidal with harmonic distortion less than 3%THD. Highly protected against faults and overloading. 1 Switching Elements IGBT for above 3KVA and MOSFET for 3KVA and below. 2 Type of Charger Maximum Power Point Tracker (MPPT). 6 Dielectric strength 1.1 KV between input/output and ground with EMI protections removed. 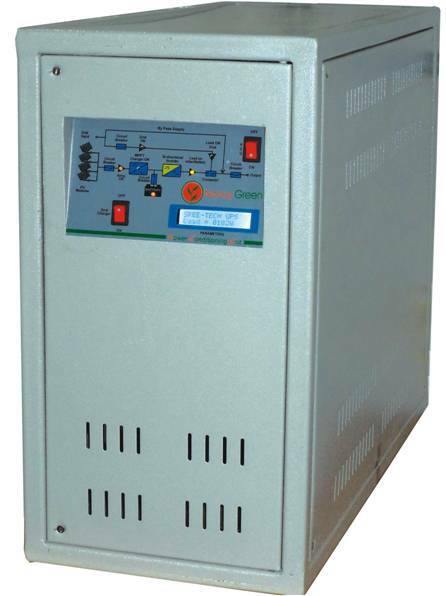 The Grid-connected Battery Back-up Single Power Conditioning Unit converts the DC power available from a Solar PV array to 1Phase AC which can be supplied to a dedicated load. The inverter automatically Tracks the PV Array (MPPT) and ensures that the maximum possible energy available from the PV arrays is utilized. The PCU's of Novus are completely provided with protection equipment that includes the above protection schemes.